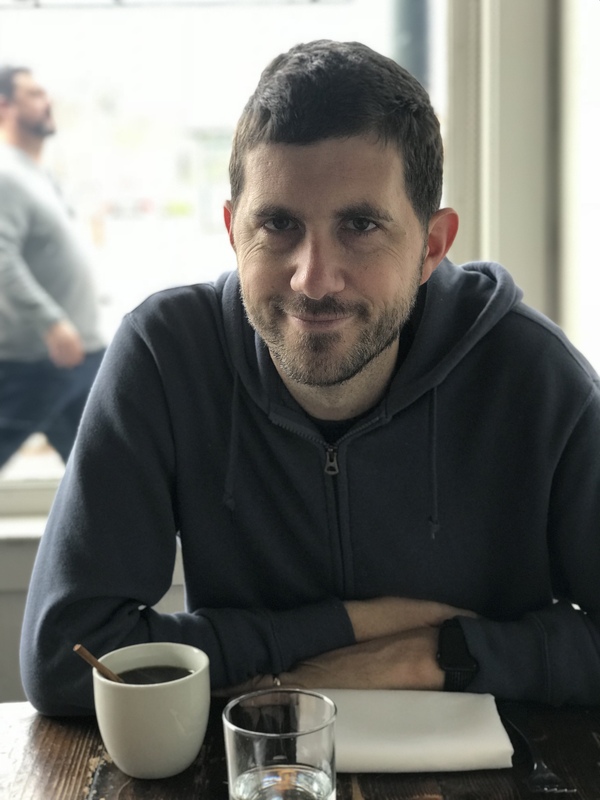 Our guest speaker at the February monthly meeting will be Matt Ewing (pictured), Chief Community Officer at Swing Left, which is currently targeting 70 Congressional races across the U.S. Matt is the former National Field Director for Moveon.org. Matt will talk about where Swing Left fits into the crazy, wonderful ecosystem of groups working to flip Congressional districts. You won't want to miss this important presentation! Following Matt’s presentation, there will be a report on MVCAN’s Airlift. Learn how much relatively small amounts of money can accomplish when they are provided directly to grassroots organizations. Missed the last MVCAN monthly meeting? Catch up with photos of the Jan. 7 MVCAN meeting from Fabrice Florin. Watch the Jan. 7 presentations about Electoral and Airlift. Many more updates and actions will be presented at the Feb. 4 meeting. This is higher level phone bank training for those who have called voters before or those who have taken Phone Bank 101. The training includes personal story creation and use of the auto-dial for Beto O'Rourke's Senate race. Register here for more details and directions on Phone Bank Training 102. Please note: The Feb. 3 Phone Bank 101 Training and Feb. 3 and Feb. 10 Text Bank Training are full! The same training will be offered Mar. 3 and Mar. 17. There are still spots for Phone Bank Training 102 – for those who have phone bank experience and would like to kick up their game. See above. Register here. Register here for regular working phone and text banks Feb. 17, Feb. 24 and Mar. 3. 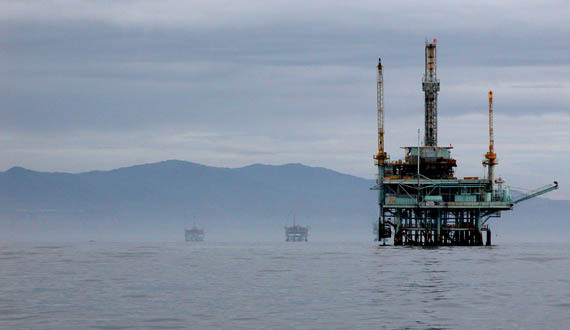 We’re putting together a crowd of MVCANers to travel to Sacramento for a critical public hearing, along with a rally and march to protest Trump’s terrible policy allowing off-shore oil drilling. Don’t let the Trump administration destroy many decades of successful environmental protection of our precious California coastline! There will be powerful speakers, music, and lots of art and chanting. You can also contact MVCAN member Liz Schumacher regarding carpooling from Marin. Our MVCAN Civil Rights/Immigration Team as been busily working with our community partner, the Marin Interfaith Council, to put on this fun and moving event. Join us as we celebrate the importance of inclusion and welcoming everyone in our community. It’s a great local opportunity to celebrate a special Valentine’s Day in Marin. Also, the Civil Rights/Immigration Team meets Sunday Feb. 4, from 12:30-1 pm (before the MVCAN Monthly Meeting at the MV Community Center). Firing Special Counsel Robert Mueller, ousting Deputy Attorney General Rod Rosenstein, or any other outrageous act of obstruction by the Republicans would be a constitutional crisis for our country. It would demand an immediate and unequivocal response to show that we will not tolerate abuse of power from Donald Trump. People’s responses in the minutes and hours following a power grab will be critical in dictating what happens next, and whether Congress will do anything to stand up to Trump. IF MUELLER IS FIRED, WE NEED TO TAKE TO THE STREETS! On a national level, MoveOn.org has organized a rapid response plan for this scenario, with progressive organizations nationwide signing up to host peaceful “Nobody is Above the Law” rallies. There are now more than 700 rallies planned, with with more than 200,000 people pre-registered! MVCAN, along with our partners in the Marin Leaders’ Network, has a rapid response plan organized if Trump removes Mueller (or commits some other outrageous act). We are collaborating with all of the other Marin progressive groups in hosting a Marin-wide rally in a single location to have better visibility and also make it easier for the media and our elected officials to attend. Location:Court Street Plaza, 4th St (in front of Coldstone Creamery) between A St. and Lootens Place, San Rafael. If Mueller is fired AFTER 2 P.M. local time —> events will begin @ noon local time the following day. CODE RED MOBILIZATION ALERT SIGN-UP: Please sign up today so that you will immediately, without delay, receive the national text alert from MoveOn.org when Code Red is activated. The MoveOn alert will also trigger us to send a MVCAN alert to our members via email. The Marin Rapid Response Network is offering training to become a Legal Observer to help monitor ICE activity. 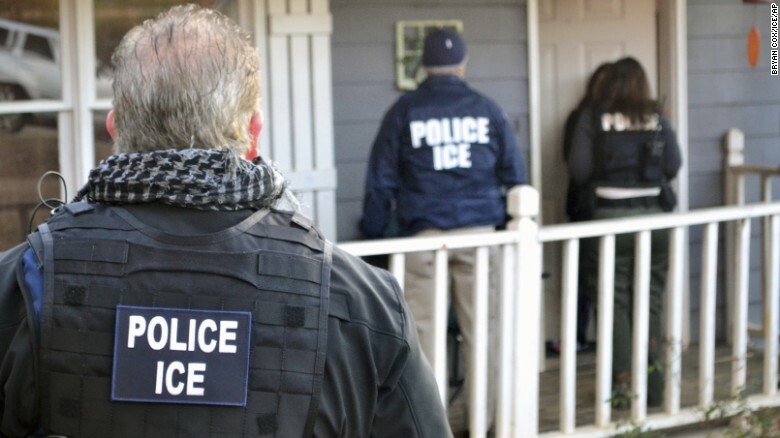 When ICE activity is reported, trained Legal Observers will be deployed to a specific area within Marin County to "document" the situation. You do not need to have a legal background or be bilingual to become a Legal Observer. Come help us keep the ICE honest and within the law! 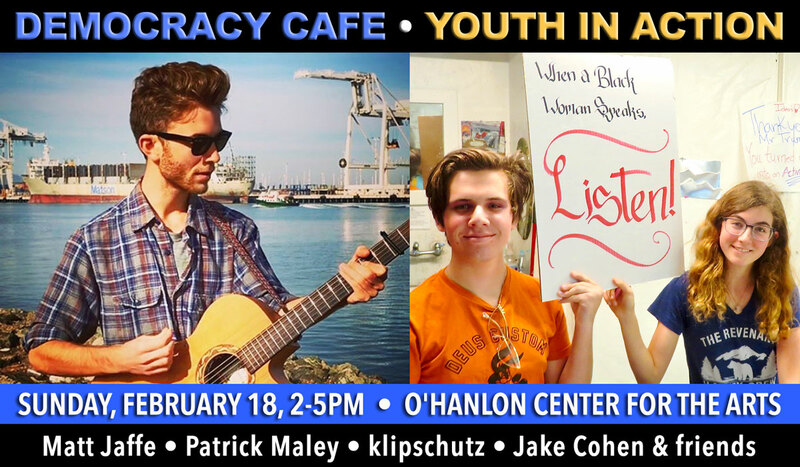 Sunday, Feb. 18, 2-5 p.m.
Come make art, music and poetry with young people – and express yourself at our second Democracy Cafe! This month’s theme is Youth In Action. We’re inviting young people to come share their views, so we can learn from each other, and help our youth participate in democracy. We will feature music and poetry by singer/songwriters Matt Jaffe, Patrick Maley and poet klipschutz. A group of high school activists led by Jake Cohen will engage us in a group discussion on how young people can take political action. You are also welcome to come create your own political signs — and brainstorm ideas for our next political parade float. Get your free ticket for Democracy Cafe here. Democracy Cafe is a new series of free art, music and social events in Marin, hosted by a group of Marin artists and activists led by Fabrice Florin. 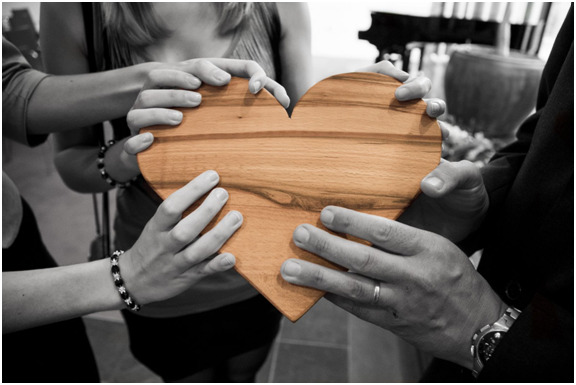 We build community and drive social change through creative expression and civic engagement. We think making art, music and talking with people of all ages and backgrounds can build mutual understanding and engage us to take meaningful political action together. WANT TO GET MORE INVOLVED? Much of MVCAN's work is done in one of our 10 awesome action teams. Click the team name to read their latest news and find their next meeting. 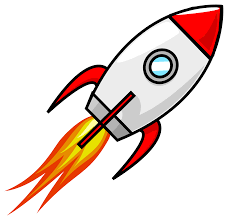 The Economic Action team has launched AIRLIFT, our first national project. AIRLIFT funnels money to grassroots groups in winnable 2018 districts. These are seriously vetted groups that work all year round in their communities-- they get tangible results without blowing through millions of dollars. Read about it in the Huffington Post . Electoral works to elect candidates for state house and governor races, and other targeted races from now through the mid-term elections, following the recommendations of the flippable.org team, which are analyzing and selecting winnable races. The Electoral team uses phone banks and travel to targeted districts to talk with voters through phone calls and door-to-door canvassing, voter registration, and campaign volunteering.